Through the centuries Royal wedding dresses have been used to promote British industry, unite the nation after conflict, steer public perception and express personal joy. The Brides have dictated wedding fashions, shaped traditions and launched or cemented the careers of many designers. For our list we have chosen the top nine notable Royal wedding dresses and considered what the Royal couples were hoping to express through the chosen designs. With the ever changing fashions and the evolving historical contexts, there’s been plenty to say. 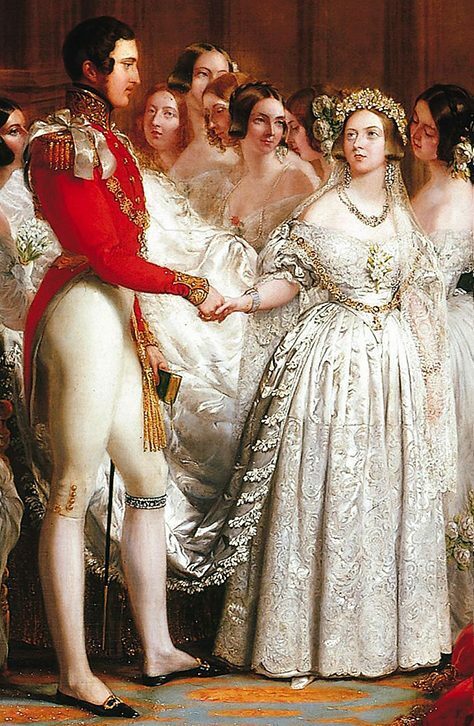 Queen Victoria is often credited with popularising the enduring fashion for white wedding dresses. However, since the Renaissance and amongst the fashionable elite, white wedding dresses were already popular; with intricate white wedding dresses covered in jewellery symbolising wealth. Given how difficult it was to achieve and maintain a true white, it was considered the height of luxury and sophistication. In the case of Queen Victoria when choosing the style for her dress, her initial intention was to support the declining British lace industry and chose white believing it would best show off the lace. The lace itself, was designed by William Dyce of the Government School of Design (Later known as the Royal College of Art) and hand appliqued to a cream coloured satin dress by Mary Bettans. The satin of the dress was woven in Spitalfields and the design reflected the popular style and silhouette of the era with a wide, off the shoulder Bertha collar and a basque waist. Queen Victoria decreed that Dyce’s lace designs should destroyed so no one else could copy them. At the time of their wedding, Lady Elizabeth Bowes-Lyon’s (later known as the Queen Mother) and Prince Albert of York were not destined to become King and Queen. Prince Albert’s older brother Prince Edward was first in line to the throne and only with his subsequent abdication to marry Wallis Simpson did Prince Albert become King George VI. This may have been a factor in Lady Elizabeth’s choice of wedding dress and the overall lack of grandeur and spectacle. Perhaps more than most wedding dresses on this list, this gown reflected the modest fashion of the time. 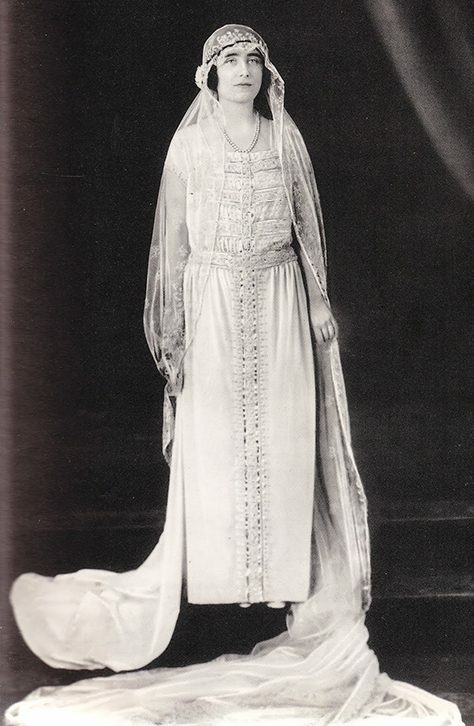 Inspired by the boyish ‘Flapper’ style dresses being designed by Coco Chanel; made from deep ivory chiffon moire, it featured a drop waist, silver embroidery and seed pearls. The Flapper style was typically suited to an androgynous figure rather than the more shapely bride so when Wallis Simpson later famously said ‘you can never be too rich or too thin’, Lady Elizabeth is said to have felt this comment was directed at her. In the years following the Second World War when Princess Elizabeth planned to wed the Duke of Edinburgh rationing was still being imposed on the British public. The young Princess, who had already served as a mechanic in the Women’s Auxiliary Territorial Service, was keen to continue shoulder her responsibilities and avoid the aura of privilege. As such, she saved her rationing coupons and received a modest gift of 200 coupons from the Government to buy the essential materials. The design, by leading British couturier Norman Hartnell, included ivory silk, duchesse satin, silver threads, crystals and 10,000 seed pearls. Despite the unconventional means of funding, the dress was still an exquisite spectacle that according to Harper’s Bazzar took inspiration from Renaissance painter Sandro Botticelli’s ‘Primavera’ and symbolised Britain’s ‘Rebirth and Growth’ after the second World War. The dress featured full length sleeves, a fitted bodice, a heart shaped neckline, a floor length panelled skirt and a dramatic 15 foot (4.5 metre) train. 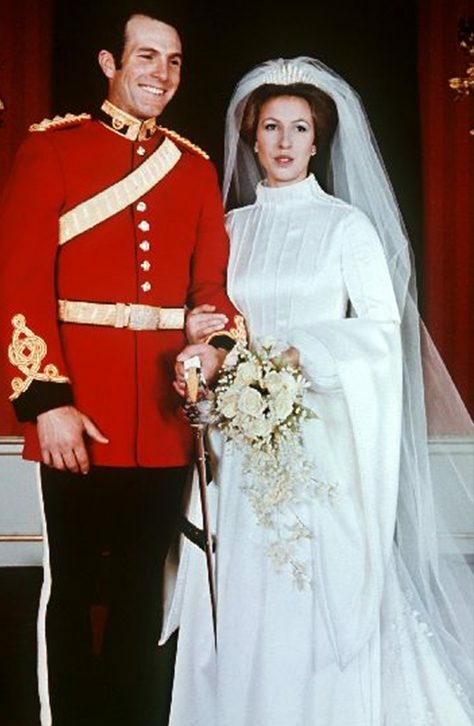 Princess Anne’s sartorial style throughout the 60s and 70s was daring by Royal standards and her wedding dress for her first marriage to Captain Mark Phillips in 1973 was no different. Described as a Tudor style dress it was made from silk and featured a high collar and dramatic medieval sleeves, that protected the Princess from the crisp November weather. Allegedly, the Princess herself came up with the idea and was keen her gown reflected the court dresses from the reign of Elizabeth I. Designed and made by Royal dressmaker Maureen Baker of the design house Susan Small, the simple and elegant gown featured understated and elegant beaded details. The pearls and silver thread that made up the fine vertical lines were embroidered by Lock & Co (now Hand & Lock). Perhaps the most famous Royal wedding of the modern era, designed by husband and wife design team David and Elizabeth Emmanuel, was for the union of Lady Diana Spencer to Prince Charles. The young Diana had previously been styled for an engagement photo-shoot in a chiffon blouse designed by the Emmanuels. Apparently, taken by the style, Diana personally selected the unknown designers to make her wedding dress. The ivory silk taffeta design included a large crinoline, oversized puff sleeves, a meringue and a 25 foot train. The bodice was trimmed with antique handmade lace which had belonged to Queen Mary and the whole dress was embroidered with thousands of sequins and over 10,000 pearls. S. Lock & Co (Now Hand & Lock) were tasked with the labour intensive and complex embroidery on the 139 metres of tulle that made up the veil. In addition to being the most secretive design project of its time the Emmanuels were challenged by practical issues posed by both the dress and the bride. The silk of the meringue and the train was prone to creasing and en-route to St Paul’s Cathedral, despite Diana’s best efforts the smooth finish couldn’t be preserved. Also Diana herself, who was suffering from bulimia in the lead up to the wedding dropped from a UK 14 dress size to a UK 10. 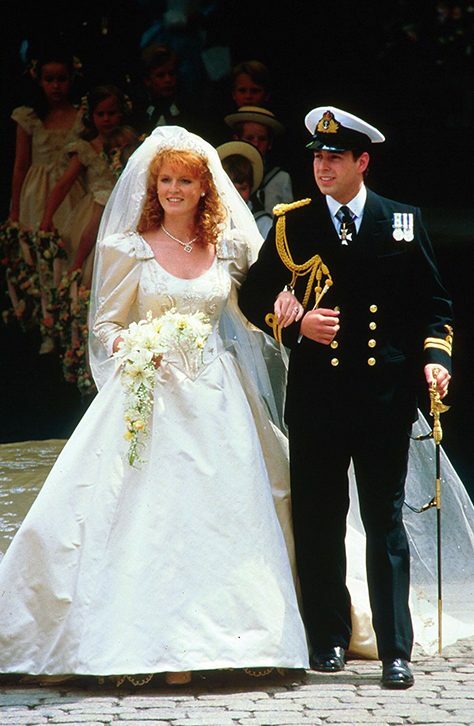 The story goes that Prince Andrew proposed to his bride to be, Sarah Ferguson with a Garrard ring he had designed himself and in turn, at their wedding in Westminster Abbey, she wore a wedding dress with motifs she had designed especially to honour him. On her 17 foot train there was an elaborate embroidered ‘A’ for Andrew, anchors, waves and hearts, symbolising his naval career and their enduring love for one another. The dress also included bumble bees and thistles which were details taken directly from her family crest, in addition to a dramatic bow falling gracefully from the back of her waistband. All these details plus a scoop neck, padded shoulders, a floral headdress and a concealed Garrard tiara suggest a gown overwrought and excessively detailed but her designer Linda Cierach succeeded in pulling it all together with grace. Cierach even managed weave into the dress a Latin motto Sarah had adopted,‘Ex Adversitas Felicitas Crescit’ which translated to ‘Out of Adversity Comes Happiness’ symbolising the troubled times Sarah felt she had overcome. 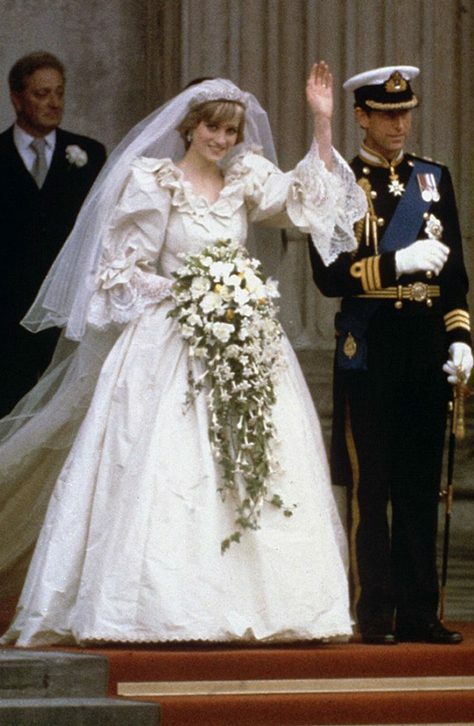 Made from exquisite duchesse satin and embroidered with seed beads, seed pearls and sequins the gown had perfect bridal proportions and a modest silhouette compared with the vast crinoline and meringue worn by Diana just five years earlier. Always conscious of how she would be compared to Diana the ever self conscious Sarah Ferguson wrote that the dress was ‘an exquisite creation’ and that Cierach was a genius who had created ‘the most flattering gown’. The wedding between Camilla Parker Bowles and Prince Charles took place at a time when the British public still had reservations about the couple following the unfortunate death of Princess Diana. As a result it was always destined to be a subtle, modest affair. Breaking with convention for a leading Royal, the wedding took place at Windsor Guildhall and the Bride wore two outfits. 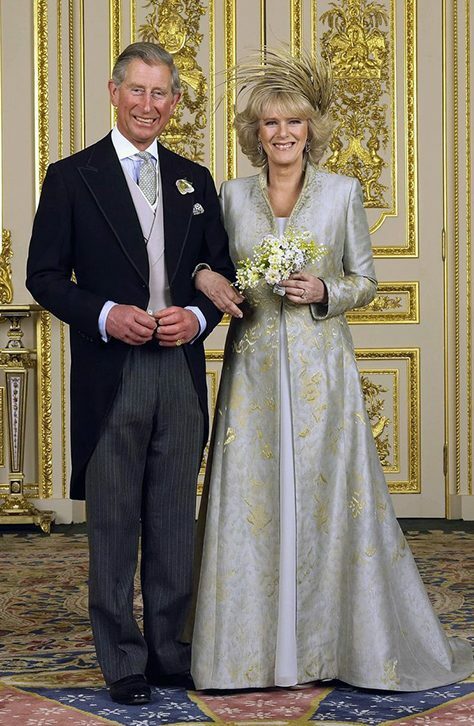 Camilla wore a loose fitting white knee length dress under a basket weave coat for the civil service before changing into a soft pale blue chiffon dress worn under a gold damask coat for the blessing. Both outfits were designed by Antonia Robinson and Anna Valentine and each design was literally topped off by Camilla’s favourite hat designer, Philip Treacy. The second of the two headpieces was a dramatic golden sculpture crafted from hand dyed feathers that highlighted the golden embroidery detail on the stiff collar of the jacket. The wedding between Kate Middleton and Prince William was estimated to have been watched by between 300 million and 2 billion viewers around the world. 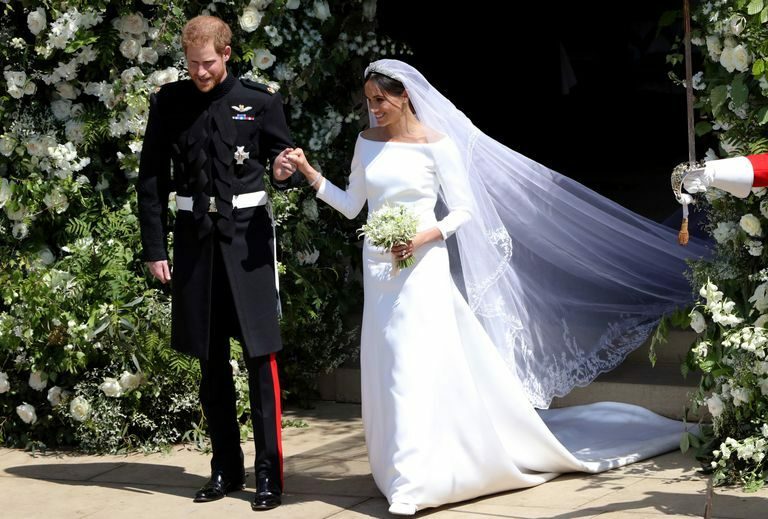 The wedding reportedly cost £26 million, most of which was spent on security with an estimated £250,000 spent on the bridal gown itself. Designed by Sarah Burton, the creative director of Alexander McQueen, the dress and the dressmaker were not officially revealed until Kate Middleton stepped from the car at Westminster Abbey. An expected but slightly controversial decision because the brand Alexander McQueen was owned by Paris based luxury goods company Kering. This meant it was the first time a Royal wedding dress hadn’t been made by a British owned fashion house. The dress was at least embroidered in the UK using skilled needle-workers from the Royal School of Needlework – even if they were unaware who the dress was ultimately intended for. The design incorporated lace sourced from France and England some of which was the same design that had been used on Grace Kelly’s Wedding dress in 1956. Side by side the two dresses bear a resemblance with the lace sleeves and lace detail on the décolletage. However, Kate’s dress featured subtle padding at the hips, soft gathered pleats that formed a semi-bustle and traditional corsetry, a hallmark of Alexander McQueen’s design aesthetic. 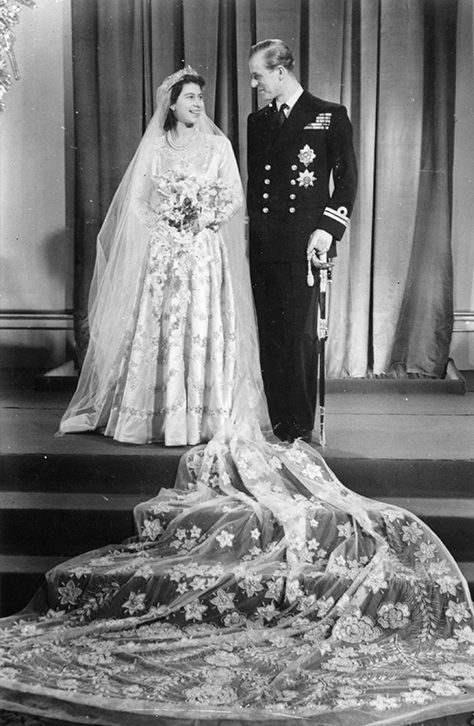 As with previous Royal wedding dresses, the design is credited with changing wedding fashions and in this case bringing sleeves back into vogue. Replicas were on sale within days of the ceremony and Chinese dress makers are alleged to have complained that images of the dress should have been leaked prior to the wedding so manufacturers could have stock ready prepared. Are you getting married too?